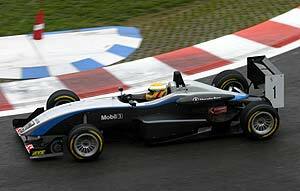 In torrential rain, Lewis Hamilton (ASM F3, Dallara-Mercedes, 2:33,705 min) took his fourth pole position in the 2005 Formula 3 Euro Series season. In the session that had to be red flagged twice, James Rossiter (Signature-Plus, Dallara-Opel, 2:34,164 min) qualified for second position on the grid while Hamiltons team-mate, Adrian Sutil (ASM F3, Dallara-Mercedes, 2:35,248 min), came third. The qualifying for the fifth round of the Formula 3 Euro Series season that will be held this afternoon at the 6.968-kilometre Belgian GP circuit, was red flagged twice: after eight minutes, Gergory Franchi (Prema Powerteam, Dallara-Opel, 2:55.409 minutes) and Giedo van der Garde (Team Rosberg, Dallara-Opel, 2:38.194 minutes) spun and stranded in the gravel. And with ten minutes to go, Marc Bonanomi (Prema Powerteam, Dallara-Opel, 2:42.443 minutes) crashed into the tyre walls above Eau Rouge after having spun several times. The Italian was brought to the Medical Centre for a checkup. In the closing minutes, both Loïc Duval (Signature-Plus, Dallara Opel, 2:35.732 minutes) and Adrian Sutil made a final effort to steal Hamiltons pole but went off and stranded in the gravel. Guillaume Moreau (Signature, Dallara-Opel, 2:35.625 minutes) was the fastest rookie and finished fifth.